How Tall Is That Man in the Video? 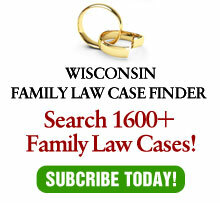 In the absence of anything interesting happening in the family law field, I’m going to comment on a criminal case from the Wisconsin Supreme Court today. While criminal law is no longer my field, I did seven years of “service” as an Assistant D.A. so I still have an interest in the field. In State v. Avery, 2010AP195, the Supreme Court reversed the decision of the court of appeals which had ordered a new trial for a defendant convicted of two armed robberies in 1994 (no, that is not a misprint – that was almost 20 years ago!). One of the items of evidence against Mr. Avery was a video from one of the robberies. In 2008, 12 years after his conviction, the circuit court held a hearing on a motion for a new trial based on newly discovered evidence. The new evidence was an “expert” who testified that based on his analysis of the video, the robber could not have been as tall as Mr. Avery. The state called a witness who testified that based on the poor quality of the video, the angle of the camera and other problems, the robber could, in fact, have been Mr. Avery’s height. a telephone conversation Mr. Avery had with his mother where he apologized for getting involved in the incidents. The court of appeals, with Judge Brennan dissenting, ordered a new trial. Today, the Supreme Court, with Justices Abrahamson and Bradley dissenting (so what else is new?) reversed. The interesting part of this case is the “junk science” nature of the video “expert.” As the court pointed out, this is not the same as DNA evidence which, if correctly done, has an almost 100% accuracy rate. Rather, the video evidence which consisted of trying to enhance the quality of the picture and then make adjustments for the angle of the camera and other variables is far from 100% accurate. In fact, one wonders whether the testimony would pass muster under Daubert, which was not in effect at the time of the hearing. ¶42 The video was not used at trial for identification purposes. Though the jury saw the video of the Malone’s robbery, the State asked the jury not to make identifications from the video because it was of such poor quality. We have no indication that the video played any part in the jury’s verdict… Moreover, the photogrammetry evidence does not discredit two witness identifications of Avery as the robber, Avery’s confession, his written apology, or his call apologizing to his mother for getting involved. What is amazing about this case is that two judges from the court of appeals and two justices of the supreme court would have granted Avery a new trial.